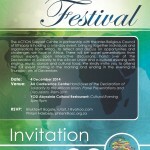 The ACTION Support Centre in partnership with the Inter-Religious Council of Ethiopia is holding a one-day event, bringing together individuals and organisations from Africa, to reflect and discuss on opportunities and challenges we face in Africa. There will be panel presentations from various experts, open interactive discussions, hand over of the Declaration of Solidarity to the African Union and a cultural evening with a cultural show and cultural food. We kindly invite you to attend the full event starting in the morning and ending in the evening of Thursday, 4th of December.